A place for prayer, love and unity, the Washington National Cathedral holds a sacred place in the hearts of all people. 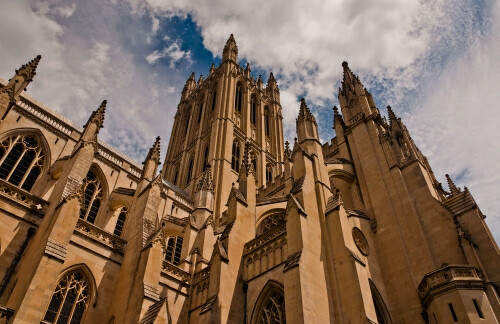 Located in Washington, DC it is an American cathedral of the Episcopal Church built in the stunning Neo-Gothic style. It must be seen to be truly appreciated-- a problem that can be solved by booking a bus with National Charter Bus. Our charter bus service operates around the clock and hosts transportation for a variety of groups, such as church goers, tourists, students and more. Pick a bus of your choice that caters to your needs and visit this historical gem of our time. Call us today at 202-250-3441 for a free, no obligation quote! 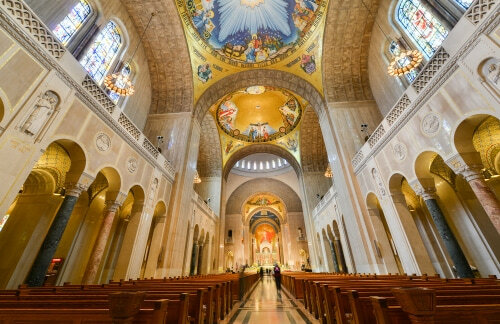 Originally known as the Cathedral Church of Saint Peter and Saint Paul in the City and Diocese of Washington, the religious site we know today is famous for many reasons. It is the sixth largest cathedral in the world, the second largest cathedral in the United States, and is listed on the National Register of Historic Places. 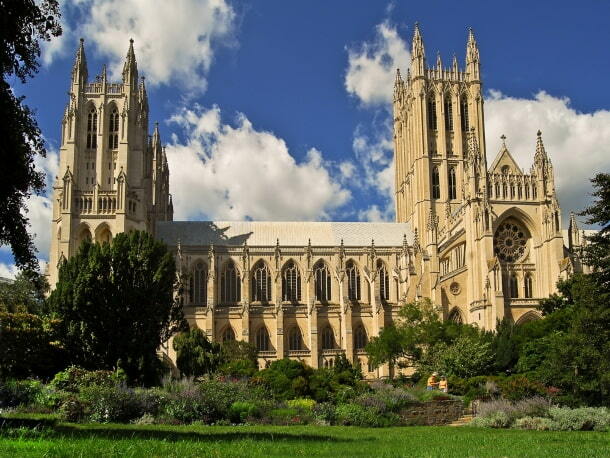 On average, 418,000 people visit the Washington National Cathedral annually. As it has been open for service daily since 1912, it is always bustling with individuals who are eager to witness its beauty in person. The Cathedral is familiar with the concept of group transportation and requires one to make a reservation ahead of time. If you utilize the transportation services offered by National Charter Bus, our team will handle everything from detailed itineraries to navigation and parking logistics, so that the only thing you need to do is purchase tickets for your visit. Our 18-passenger minibus is perfect for a small church group-- the cushioned seats and climate-controlled interiors will ensure that every church goer has a peaceful and comfortable trip. On the other hand, the 56-passenger charter bus is a more luxurious option since it has more seating and larger luggage compartments. This bus is favored by foreign tourist groups, as they are able to store their cameras, passports and sketchbooks in the spacious overhead cabins, where they will be safe from theft and misuse. If you are a student group of around 20-25 passengers, the medium-sized minibus is the best model. The free WiFi, numerous electrical outlets and entertainment options on board will keep every student satisfied throughout the duration of their trip. Avoid the last-minute rush and book your transportation in advance with National Charter Bus. If you call us at 202-250-3441, a reservation specialist will pair you with an immaculate bus rental. We understand that trip planning can be stressful, so leave it to us to handle every detail. The Cathedral shares a similar interest with National Charter Bus-- it is open every single day of the week. From Mondays to Fridays it is open from 10 am to 5 pm, on Saturdays from 10 am to 4 pm, and on Sundays from 8 am to 12:45 pm. Ticket prices range from person to person. $8: Seniors, students with ID, active military with ID and veterans. There are individual highlights tours that are included with the Cathedral admission. They are offered from Monday to Saturday at 10:15 am, 11 am, 1 pm, 2 pm and 3 pm, while on Sunday the timings are prone to change. For groups of 15 and more, there are 30 minute tours offered, usually conducted by a Cathedral docent who provides a brief history of the art, architecture and religious significance. Other specialty tours can be found here. The Washington National Cathedral offers daily worship and follows the Book of Common Prayer. The services are open to everyone, regardless of age, race or ethnicity. They also have a sacred space for meditation at the Center for Prayer & Pilgrimage, where people can find a space to relax and sit in silence. 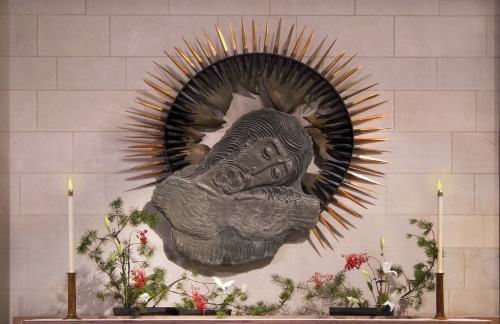 In recent years, the Cathedral has developed an extensive set of initiatives, such as assisting Veterans, ending gun violence, advocating for LGBT rights, promoting the acceptance of all races in America and actively pursuing interfaith collaboration. The Rose Window: This 26 foot window is located in the center of the nave and is designed to represent light radiating outward like the petals of a rose. The key colors include the four Greek elements: red for fire, green for water, gray for air and brown for the earth. Darth Vader: This is by far the most popular carving at the Cathedral. It is a Darth Vader gargoyle placed upon the northwest tower. It was initially submitted in the form of a drawing on behalf of the Cathedral’s design-a-carving competition. After the designer won third place, it was mutually agreed upon to turn it into a sculpture, so that it could be admired at a distance, with binoculars. Space Window: An incredible addition to the Cathedral is a window that contains a 7.18-gram basalt lunar rock from the Sea of Tranquility on the Moon. It was donated to the Cathedral by the Apollo 11 crew and was dedicated to the fifth lunar landing. Canterbury Pulpit: This pulpit is famous because it has hosted every important person in history-- from the former U.S presidents to the Dalai Lama. A notable fact is that Rev. Dr. Martin Luther King Jr preached his last sermon here before his assassination a week later. Famous statues: The beauty of the internal architecture is amplified by the statues of historical and humanitarian figures who have contributed to U.S history in some way. A few include George Washington, Abraham Lincoln, Mother Teresa and Rosa Parks. Burials: Apart from the statues, there are several notable American citizens buried in the Cathedral, such as President Woodrow Wilson and Helen Keller. Axis: The Cathedral’s east-west axis is slightly off-center by six feet-- there is no straight line as one would imagine, from the nave to the carving of Christ. This was a deliberate mistake that is common in most Medieval Cathedrals, to signify the imperfection of the world. 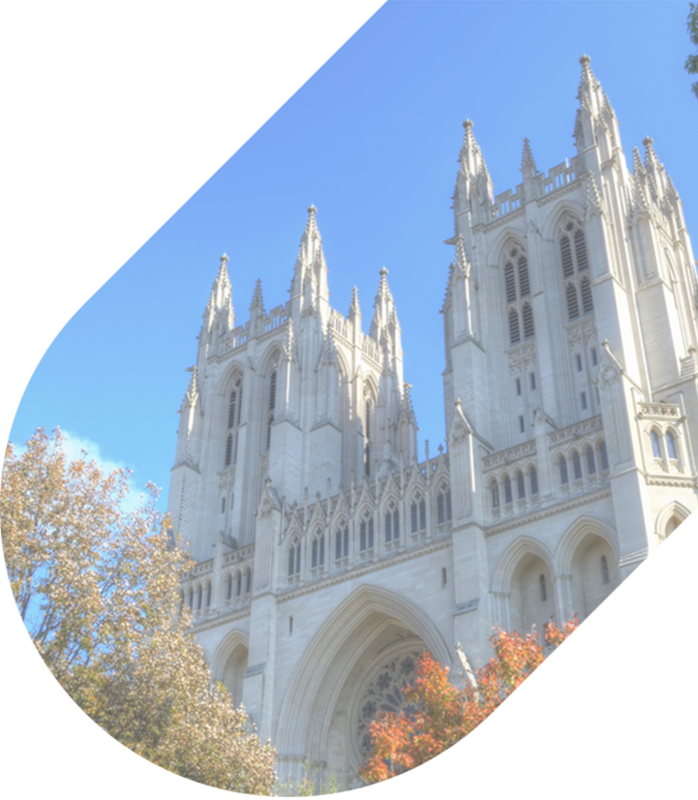 Touring the Washington National Cathedral in a day can be an emotional yet exhausting venture, as it is a highly complex structure with a history spanning over 200 years. National Charter Bus recommends planning your itinerary ahead of time, so that your trip to the Cathedral can be spread out over a course of 2 or 3 days. This timeline gives you and your group ample time to meditate, explore the architecture and enjoy the interactive tours on site. In addition to DC, our extensive network allows us to charter rentals in other states in the Northeast, such as Virginia, Massachusetts, New York and Philadelphia. For more information, contact our reservation specialists today at 202-250-3441 to book your transport to the Washington National Cathedral!